There are 2 ferry routes operating between Gulf of Napoli and Pontine Islands offering you combined total of 10 sailings per week. SNAV operates 2 routes, Casamicciola to Ponza runs 5 times per week & Casamicciola to Ventotene about 5 times weekly. As the frequency and duration of crossings on some routes varies we would advise that you do a live search for crossings from Gulf of Napoli to Pontine Islands to get the most up to date information. The Gulf of Napoli, also known as the Bay of Naples, is located on the southwest coast of Italy, with the city of Naples to the north and the Tyrrhenian Sea to the west. 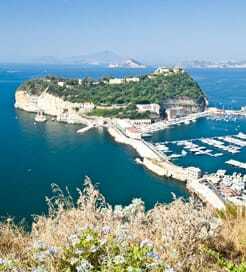 The Gulf of Napoli is home some of the world’s most enchanting and beautiful islands, namely Capri, Ischia and Procida, as well as numerous picturesque towns with gorgeous coastal views. Immerse yourself in the region’s history with a visit to Mount Vesuvius and the Roman ruins of Pompeii and Herculaneum, or spend your day simply indulging in the celebrated Neapolitan cuisine. There is a wide choice of ferry routes from the Gulf of Napoli’s islands to many cities on the mainland coast, operated by a number of excellent ferry companies. There are also frequent, high-speed crossings available to the Pontine Islands to the west. 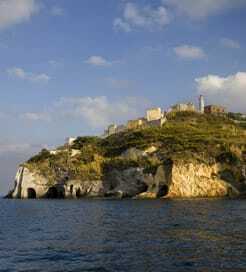 The Pontine Islands are a group of six islands situated South of Rome and Northwest of Naples in the Tyrrhenian Sea. Relatively unknown amongst seasonal travellers and even Italians, the islands are one of the best-kept secrets in Italy. With a mild climate, beautiful nature, a variety of coastlines, attractive villages with colourful houses and delightful ports in pure Mediterranean style, the Pontine Islands are a great place to enjoy the nature.